Photo courtesy of Jeane Ostnes Rinear. Lars Rasmussen Ostnes was born in Ostnes, Norway, on March 31, 1883, the second of five children. Lars lost his father to a North Sea accident in 1892. In order to help out his widowed mother, at the age of 14, Lars went out to sea but continued his education in the fall and winter months. Soon stories of the fabled Klondike Gold Rush began to filter into Norway. Lars continued to support his family in the North Sea fisheries but the lure of gold had already made its mark. When Lars turned nineteen, he and his sister Lena left Norway arriving in New York in early 1903. Almost immediately, the two traveled to Seattle where Lars joined the crew of the schooner Nellie Coleman, a sail-driven commercial craft of 160 tons, fishing in the Bering Sea. Heavy double-ended dories were sent out from the mother ship daily and were normally operated with two men. Lars, six feet four inches tall and extremely strong, often handled a dory by himself. Even in those days of iron-tough men, this was unheard of. Lars stayed with the Nellie Coleman for two years before deciding to try his luck in mining. In 1905, Lars went to work at a hydraulic mine in the Silver Bow Basin outside Juneau, Alaska. At the end of the mining season he traveled to Skagway, where he spent the winter working for White Pass and Yukon Railroad (WP&YR). Lars' efforts on the WP&YR served two purposes: money to buy his own mining ground, and free transportation to Whitehorse, Yukon Territory, Canada - the head of rail navigation. In June 1906, Lars left Whitehorse, and set off down river for Dawson, Yukon Territory, Canada, while the water was high and fast. He bought a sixteen foot boat, took on four paying passengers and guided them through the 460 river miles to Dawson. That summer Lars had a lease on the celebrated #27 Eldorado claim owned by "King of the Klondike", Alexander McDonald. Lars recognized that opportunities in the Klondike were diminishing for individual miners, but he saved enough money in the spring and summer of 1906 allowed him to travel to Fairbanks, Alaska, where he stayed for about two years. Lars was in demand because he knew how to repair the cables used in the drift mines of the Fairbanks District. One mine owner asked his foreman how many men it would take to repair the camp's broken cables. The foreman pointed to Lars and said, "Just that big Norwegian over there." In the fall of 1908, Lars leased the Cushby Fraction between 1 and 2 Below on Dome Creek and conducted drift mining. By fall of 1909, Lars and his partner, George Lippett, were among several hundred prospectors that had arrived in the Iditarod region of western Alaska, where gold had been discovered the previous year. Lars operated a drift mine on First Chance Creek. By the spring of 1910, Lars had purchased No. 1 Above Discovery on Otter Creek with partners Jack Merrit, Angus MacKenzie and the Bates brothers, Bill and Gil. 1910 was a good year for Lars and his partners: one clean up of their open cut operation returned 380 ounces of gold in 80 hours and another produced 265 ounces in 60 hours. Their biggest clean up was about 1,300 ounces of gold, worth $27,000. The relationship between the Bates brothers and Lars continued for quite some time. Of the five partners, Lars was singled out as the best prospector in the group and often spent his summers looking for replacement ground in anticipation of the day when #1 Above Discovery on Otter Creek would be mined out. In 1911, he was part of the Aniak stampede, mushing his dog team with a loaded sled 110 miles to the new discovery. Lars was successful to such an extent that he made the decision to go "outside" to Seattle for the winter to visit his sister Jakopia, and spend some of his hard-earned dollars on new clothing, fresh cigars, fresh fruit and vegetables, and church and lodge social events. By all accounts, Lars took to the softer ways of the city folk and was frequently seen at social functions around Seattle. In March, 1912, Lars took the first steamboat back to Seward and then hit the Iditarod Trail again back to Discovery Otter. Lars remained at Discovery on Otter that winter and played Santa Claus at the annual Christmas celebration. By 1914, Lars was probably working as a rigging foreman for Riley and Marston Company on their dredge on Black Creek. That winter Lars returned to Seattle where he stayed with his sister. When Lars arrived back in the Iditarod country in the spring of 1915, he brought with him a 93-foot Douglas fir pole. With it, Lars erected the first slack-line scraper in Iditarod district at Frank Manley's operation on Willow Creek. "You have spent all your money now, so you go back up to Alaska and make your big stake, then we'll discuss marriage." That spring Lars heard of a new strike in the Tolstoi district. He spent part of the summer prospecting and mining there, and apparently did well, but when he left Alaska at the end of the season, he had no plans to return to Tolstoi. On his arrival in Seattle Lars renewed his courtship with Elise, and they were married on February 16, 1917. They concluded an extensive honeymoon trip with a month long journey from Seattle to Iditarod covering almost 3,000 miles. Gil Bates and his new bride traveled with them, and when the couples arrived in Iditarod the community went all out to celebrate the marriages. A big party was held at the McDonald Hotel. Elise was a big hit, in part because she went right to work helping prepare the food for her own welcoming party. The next day Lars and Elise traveled to Flat over the wooden tramway previously built by Peter Miscovich and his crew. During the summer of 1917, Lars worked as a rigger foreman on a dredge for Beaton, Bates, Dawson and Longten near Black Creek (this dredge would later be known as the "Beaton and Donnelly" dredge). Lars and Elise decided to remain in Flat during the winter of 1918-1919, as Lars had a winter job and, more importantly, because Elise was six months pregnant when navigation closed for the year. They sold their return round trip tickets to Mrs. Johnny Beaton. Mrs. Beaton and her two children boarded the ill-fated S. S. Princess Sophia bound for Victoria; the boat sank in a storm in Lynn Canal, and all 400 aboard were drowned. Lars and Elise were devastated by the deaths of Mrs. Beaton and her children, as were many others in the Iditarod country. The year ended on a happier note, however: Lars and Elise had their first child, a son, Leif Robert Ostnes, on December 28, 1918, in their cabin in Discovery Otter. Elise remembered that it was 60 degrees below zero when she went into labor. Lars mushed to Iditarod to get Dr. Behla and his nurse, Mrs. Young. During the winter of 1918, Lars was one of twenty men employed in the three mines working the Iditarod district. He was involved in the towing of the Beaton & Donnelly Dredge down Black Creek to Otter Creek. In the early summer of 1919 Lars received a letter for which he had been waiting for nearly a year. On June 9, 1919, Lars Rassmuson Ostnes became a citizen of the United States. Elise, too, became a citizen through their marriage. That fall Lars and Elise decided to take a vacation to Norway. Though they were urged to stay in Norway, Lars and Elise headed back to America. On their way back from Norway, Lars was offered a job with the Concord Oil Company in Texas. Since many former gold miners were now in the black gold game, Lars and family headed to Mexia, Texas in 1921. Over one hundred men labored at the work site, and Lars brought in several big 'gushers'. When their second child, Eleanor Sophia, was born on May 2, 1922, there was no time to get the doctor, so Elise took charge and coached an excited Lars through the process. "Lars, where do you want me to bury you? If we stay here, I'll have to bury you here." "I've never gone wrong yet in taking your advice." They left Texas in 1924, and toured the western U.S. on their way to Seattle. Shortly after arriving in Seattle their third child Olive Adeline was born on November 26, 1924. In a quirk of fate, Olive was born at home and delivered by the same Dr. Behla from Alaska who had delivered Leif. Lars worked with N. C. Jensen doing "wildcat" oil drilling in Washington until around 1929. But Alaska remained in his mind as his real home so when the effects of the Great Depression began to be felt, Lars made the decision to return to Alaska. By the summer of 1930 Lars and his partner Jim Johnston were in the Marshall District in western Alaska, where they leased the Bon Rosa claim on Willow Creek from George Marsh. In the 1930's Willow Creek was one of the few creeks in the district with good pay. Starting this new operation from scratch, they returned to hand mining. When weather conditions made it impossible to continue the two partners would work at various settlements along the Yukon River. They stayed at Mountain Village through two winters, but after 1932, they stayed at Willow Creek. Lars worked there through 1936 while Elise and the children remained in Seattle. "Cash, 120 days from delivery." The loan was approved by a handshake. With it, Lars purchased one RD-7 Caterpillar tractor, a P & H model 705 dragline, a welder, sluice box parts and a water pump. The outfit was transported by boat, then rail, and finally delivered at Marshall Landing by barge with the riverboat Nenana. Lars ran a three shift per day operation that year with wages of $6.00 per 12-hour shift. The camp was known for its superior grub, an important consideration for those seeking work in the depths of the Depression. Elise and the children joined Lars that summer, arriving by bush plane following a long sea voyage from Seattle. Leif Robert, the eldest Ostnes son, immediately began a mining apprenticeship. Lars made Leif his Assistant Superintendent when Jim Johnston passed away in the mid 1940s. The ground being mined by their Willow Creek Mining Company averaged $1.25 per bedrock foot, or about $1.15 per cubic yard, which was good pay by any standard. Unlike the Iditarod gravels, Willow Creek was full of coarse gravel and large boulders, which presented continuing challenges to the operation. The gold was coarse and rough, and occurred throughout the lower eight feet of gravel instead of on bedrock as in most other creeks. In the early 1940s, the Willow Creek Mining Company worked a 300 to 500 feet wide pay streak in lower Willow Creek. It was reported to contain a phenomenal $3.00 a bedrock foot. That year a D8 Caterpillar was delivered to Willow Creek as well as a new Washington Iron works washing plant. By the late 1940s, the mine reverted to wing gates and hydraulic nozzles to push gravels toward elevated sluice boxes. During one of their more successful years, a single clean-up produced 1,785 ounces of gold. Close to 40 miners held that gold, and many pictures were taken. As in Lars' earlier years, another World War affected his life during the 1940s. The Willow Creek Mining Company must have received a special permit to continue gold mining during World War II, since non-essential mining activities were banned by the War Production Board in 1942. Because of costs and equipment availability, Lars' efforts on Willow Creek were significantly reduced during the war. Elise took over the job of cooking for the camp and ordering supplies for the season. Supplies were delayed, travel was curtailed and most of the manpower was off to war, including Leif. In February, 1943, Lars went to Texas to pin Pilot wings on Leif. Leif went on to pilot B-17 bombers in Europe. After the war, Leif returned and established a family in Fairbanks, returning also to Lars' mine on Willow Creek. The mining was done with the dragline, bulldozer and the washing plant. Leif continued work at Willow Creek through 1949. By that time he and Meredith had four children. In 1950 Leif worked at Morelock Creek mining for Earl Wyman, Max Fenton and Ed Ferrel. In 1951 Leif worked for the Strandberg and Sons and for Miscovich operating in his birthplace, Discovery on Otter Creek near Iditarod. In 1951 and 1952 Leif and son Larry returned to work with the Willow Creek Mining Company. Lars continued his bulldozer and hydraulic operation with four workers. Lars hired local residents at different times over the years including Bill Amouak, Bob Kamoka, Vernon Evan, Tom Oney, Johnny Oney, Don Hunter, Vernon Hunter, George Dahl and John Fitzhugh, Jr. Vernon worked at Willow Creek Mine in 1948 and again in 1952 and indicated that the mine should have been called "Vat in Hell" for the number of times he heard Lars exclaim those words. In 1953 the Willow Creek Mining Company changed its name to Lars Ostnes and Company. Lars and Elise had three workers, including Leif, and Lars' grandson, Larry. By 1954, only the Ostnes operation remained in the Marshall District. By December of 1954, Lars was 71 years old and had decided to sell his mining equipment. A Fairbanks Daily News article indicated that though he had "decided to sell his mining equipment he made it clear to his friends that he does not intend to retire." Another article mentioned, "He is not retiring though - he has seen too many men retire then die. When he disposes of his mining equipment he is going prospecting again - and for gold...."
"Who is going to give me a hug first?" They all gave him hugs and received their just rewards in candy. In February, 1972, Lars passed away. Their youngest daughter Olive also passed away the same year. At the time of his death the Alaska State Legislature honored Lars in House Concurrent Resolution No. 58, passed April 4, 1972 and signed by Speaker of the House, Gene Guess and President of the Senate, Jay Hammond. 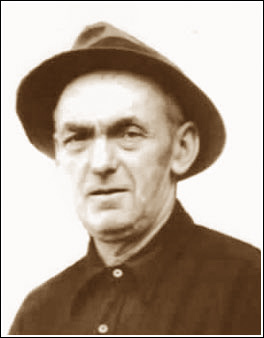 It stated in part that Lars was one of the earliest pioneer Alaskan miners and that he also employed all methods of mining in the far north during his career, from the industry's crude beginnings to modern methods currently utilized. Lars Ostnes' fortitude and perseverance typify that of pioneer Alaskans who opened many areas of the state to settlement. Elise continued to live independently in Seattle until she was 92. She fell and broke a hip in 1982 and entered the Riverton Heights Nursing Home at the age of 98. She lived well and happy until September 15, 1985 when she passed away in her sleep two months past her 100th birthday. Lars and Elise are buried in a Mausoleum at the Washeli Evergreen Cemetery in Seattle, Washington. Near this Mausoleum is the family plot that now has Olive Ostnes McClain, Leif Robert Ostnes, Oswald "Ozzie" Vistaunet, and Lars' sister Jakopia Olive and her husband Olaf Ovaara.